For Kevin Snyder (BS ’07, management), it was a dream come true: he landed a job at Vail Resorts, fresh out of the Leeds School of Business. It all started by volunteering as project manager through a class at Leeds. The project was a sustainability initiative which required that he work closely with Julie Klein, Vail Resorts’ director of Environmental Affairs. Following the success of that project, Snyder took a systematic approach based on building and maintaining relationships, leading up to his job offer fresh out of the school of business. He now works for Aaron Rubinstein, a senior procurement analyst in Vail Resorts’ Broomfield corporate offices (just 11 miles from the University of Colorado’s Boulder campus). 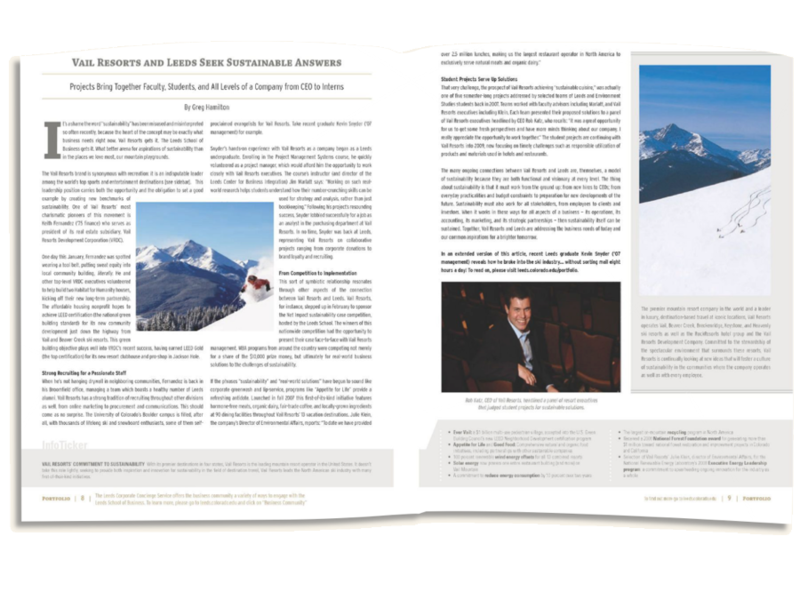 His advice for students and graduates who would like to follow his lead, to a career at a company like Vail Resorts? “Build and maintain relationships, and opportunities will follow. I’ve been unbelievably impressed by how many doors the Leeds School of Business has opened for me.” Or try the mailroom.